For the past weeks I have been wanting to read about the recent team camps, training, and introduction of the new 2012 team kits and bikes, but with the recent holiday period I was aware that I was falling behind and missing out on a lot of great news. For those of us lucky enough to have spent the time with family, and in the name of learning more about the sport, I offer a quick snapshot of some highlights you may have missed. It is time to catch up on news from the teams, characters, and equipment of professional cycling. 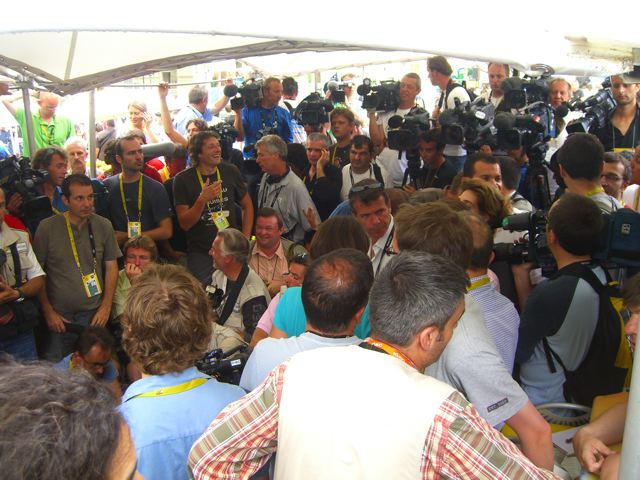 Journalists: Pro cyclists are not the only ones changing teams, a number of journalists have found new homes for 2012. For starters John Wilcockson will now be writing for Peloton Magazine, and Red Kite Prayer. Charles Pelkey will also be writing for Red Kite Prayer. The third journalist (rather a very informed cartoonist) to recently flee VeloNews was Patrick O'Grady, I am uncertain where he is headed. Dan Wuori who began as a snarky Tweeter stepped in as these 3 big-hitters were heading for the exit, he has been writing The Livestream Diaries for VeloNews. Wuori also hangs out with Browne Eye's Neil Browne who is back to developing his own projects (Tour Chats). Good to see Dan Wuori doing well, although I am a fan of well-crafted snark only, and get annoyed with the massive waste of time of so many tweets and blogs (I say that as a blogger). Update 01/11/12: Pavé blog is closing shop and founder Whit Yost will be writing for Red Kite Prayer and Bicycling.com. Recommended Blogs: Which reminds me I have updated my recommended blog list for 2012, found in the right hand column of this blog. A summary of the best for those interested in bikes, teams, traveling, and generally good people. Racing already! The Santos Tour Down Under is January 15-22, 2012 in Australia. The big news of the day was that ASO forms partnership with Tour Down Under. Yes that ASO, the same good folks who run the Tour de France and so many other prominent races. PezCyclingNews Read their EuroTrash Mondays series and EuroTrash Thursday series. Daily Peloton A little less mainstream news on Pro Teams and Continental Teams, you'll actually broaden your knowledge. A list of other Cycling News sites can be found in the right hand column of this blog. Peloton Magazine An online mag that I believe will be growing into the future.